I got the quilt top done. I can now add this quilt top to the growing pile of quilt tops I have to quilt. I hope I can get to quilting it this spring so I can put it in the quilt show. 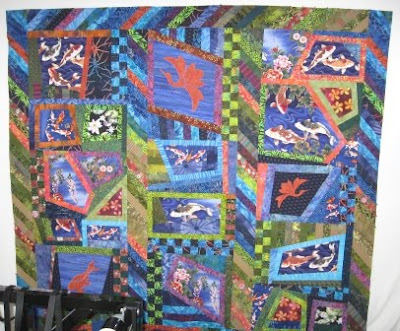 The Edmonton and District Quilt Guild is having a quilt show in June 11 and 12th. For more about the guild see the site Here. I spend a fair bit of time playing with the boarders. The strip sets I had were not as bright as I wanted. I have to rip out parts and insert brighter bits of lime green and orange. The quilt is about 72" by 82". I think I did a good job. This quilt does not look like a workshop quilt. I did start it in Gloria Laughman's class a couple of years ago. I think that when it is quilted I should email her a good photo. So the first photo did not get the bottom row so I took the quilt outside. I got this to show the last row off better. 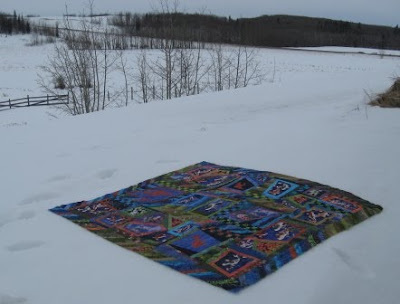 The quilt is outside on the snow. We have so much snow. I just needed to find a clean spot. Be careful of the yellow snow. 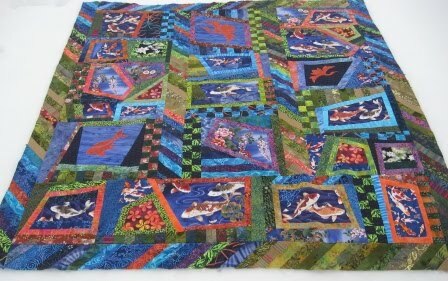 A Fish Pond Quilt landscape shot. I now get to start the next quilt. More on that this weekend. I must be getting my quilt mojo back. It's great Cathy. I'm hoping to finish a quilt top tomorrow and then i have some other things to get back to. Have a great weekend.